A dark star fell from the sky bringing with it the end of all things! The sanctity of the world known as Abaddon was shattered when a global apocalyptic event of a meteor impacting the planet causing a destructive ecological and eldritch change. Now there is no day or night, just never ending Apocalypse. 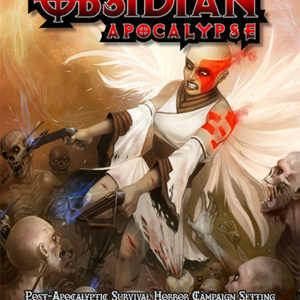 Adventure Path Iconics: Lords of Undeath adds four new iconics based on the new races from Races of Obsidian Apocalypse: Flesh and Iron to the Obsidian Apocalypse campaign setting making the world even more interesting and just as dangerous. Are you willing to take up the fight? Promethean (Flesh and Clockwork): Prometheans suffer lingering mental effects from their creation rites. 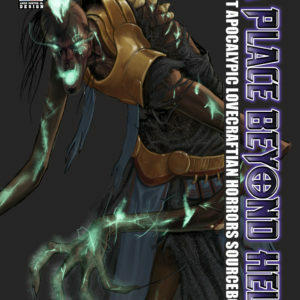 The flesh prometheans have a personality made from an amalgam of souls, cobbled together from various creatures. Clockwork prometheans have the luxury of a solitary mind, but the creation rites cause them as much torment as they do to their flesh-bound cousins. Raijin: When an outraged spirit of one slain by the undead lords of Abaddon possesses a survivor filled with desires for revenge, the two form a powerful and terrifying force, a raijin. A synergy of life and death, it can reach into the netherworld and manifest some powers of the dead in the physical world. Uzamati: The only uzamati trait that stands out in their normal form is the purple irises of their eyes. But, when an uzamati phases out, all semblance of normalcy disappears. They melt into pure negative energy, becoming twisted in the process: Their skin turns a deep purple and exudes a strong glow. Their bodies become slightly transparent and gaunt as a skeleton.